The internet was abuzz when rumours of his death swept across social media last weekend. 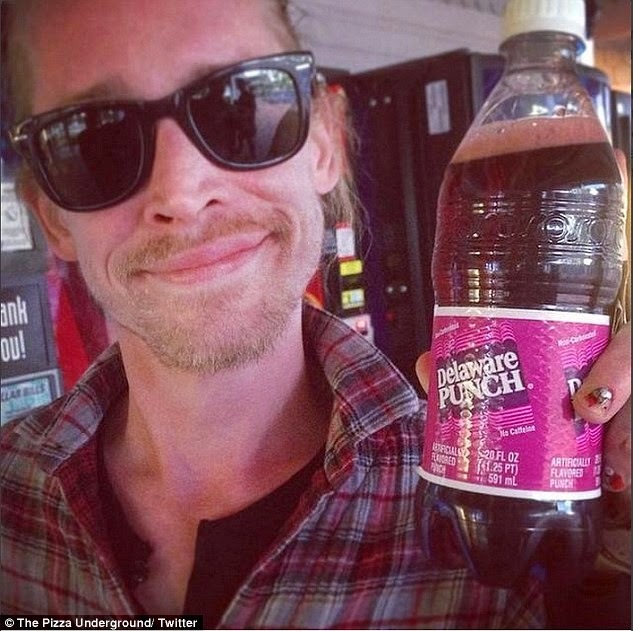 But Macaulay Culkin proved he was very much alive and kicking as he arrived for a performance with his band The Pizza Underground at the El Rey Theatre in Los Angeles on Saturday. Health appeared to be the last thing from the 34-year-old star's mind, though, as he rolled up puffing on a cigarette and with a fast food meal from In-N-Out Burger in hand. Frontman Macaulay looked ready to hit the stage as he donned a black jacket over a white top tucked into a pair of skinny black boots and finished off the look with beat-up dark brown lace-up boots. 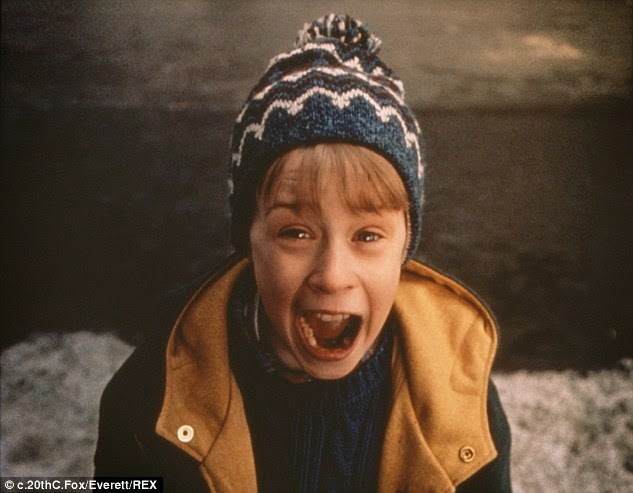 The Home Alone actor accessorised the outfit with a pair of oval-shaped designer shades, a brown leather belt around his waist with a 'Welcome To Las Vegas' belt buckle and multiple bracelets around his wrists. The actor shed his child star image as he had a bit of scruff on his face while having his long blonde locks up in an on-trend man bun. 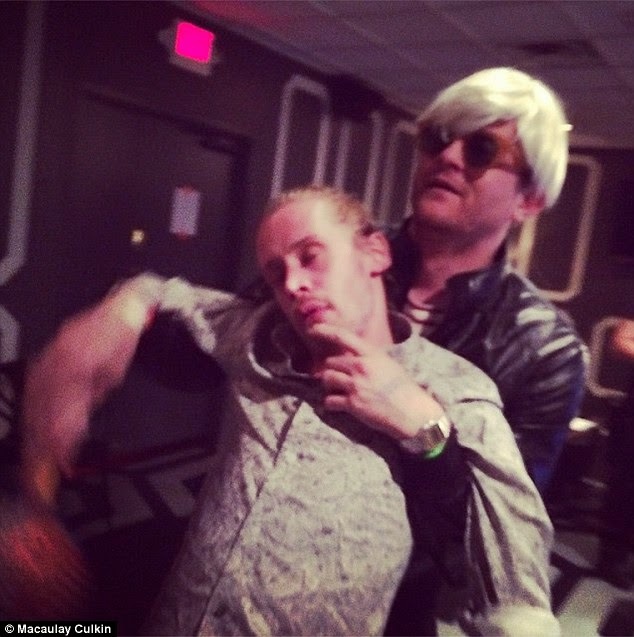 As Macaulay's band has developed quite a fan following, his tambourine player/ back-up vocalist Austin Kilham tried to shield the former actor from the cameras of his adoring followers. The Pizza Underground is a comedy rock band that parodies songs based on Lou Reed fronted rock band of the Sixties and Seventies; The Velvet Underground. No doubt that the Richie Rich actor has a healthy sense of humour as he responded to the false reports that he had died with a cheeky post from the band's Instagram account. Last Sunday he and his band posted two staged photos meant to parody 1989 comedy Weekend At Bernie's on the picture sharing site. In the film two young insurance corporation employees find their boss is deceased but must actually pretend their murdered employer is really alive. The Pizza Underground's parody photos, which were posted onto their official Instagram last Saturday and Sunday, had Macaulay playing the role of Bernie. One of his bandmates, was dressed as 'Anchovy' Warhol (a fitting touch of surrealism) and dragged Macaulay around in both of the snaps. With one photo from the group's Saturday night stage show and another from backstage, everyone seemed to be having a good time. On November 7, a report began circulating that Home Alone actor Macaulay had been found dead in his New York City apartment. But the actor-turned-musician dispelled the death hoax on Saturday as he shared photos proving that he's still very much alive and kicking.